For the record, I need to start by confessing that a week after I sent in my deposit for the workshop, I got cold feet and tried to back out of it. I had been told by a number of people that Nancy Crow was hard on you. I didn’t want to work hard! Fortunately for me, there was no backsies. And since I didn’t want to forfeit my deposit, I went ahead with my plans to attend. This was, without a doubt, one of the very best workshops and retreats that I have ever attended. The surroundings were beautiful, the workspace provided was superb, the pace was exhilarating, the instruction and inspiration were above reproach, and the food was out of this world. I talked a bit about the retreat on my other blog, so I am going to concentrate on the actual workshop in this blog. First, I want to address that reputation that being in a workshop with Nancy Crow is hard. Somehow the fact that she is honest in her critique of your work and has high expectations of each participant has gotten a bad rap. Nothing could be further from the truth. It was refreshing to have a teacher that is passionate about art and wants to convey that to her students and help them to become the best that they can be. 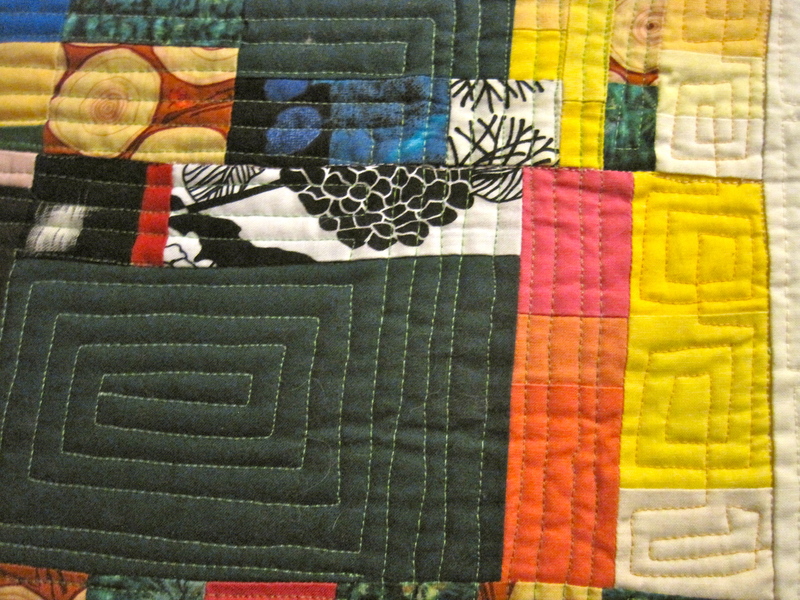 After a brief introduction to what we would be trying to accomplish–a discussion of figure/ground and how it pertains to art in quilting, and some instructions on what strip piecing and restructuring would involve, we were given a number of exercises to do, which involved cutting fabric selvedge to selvedge (sans ruler!) 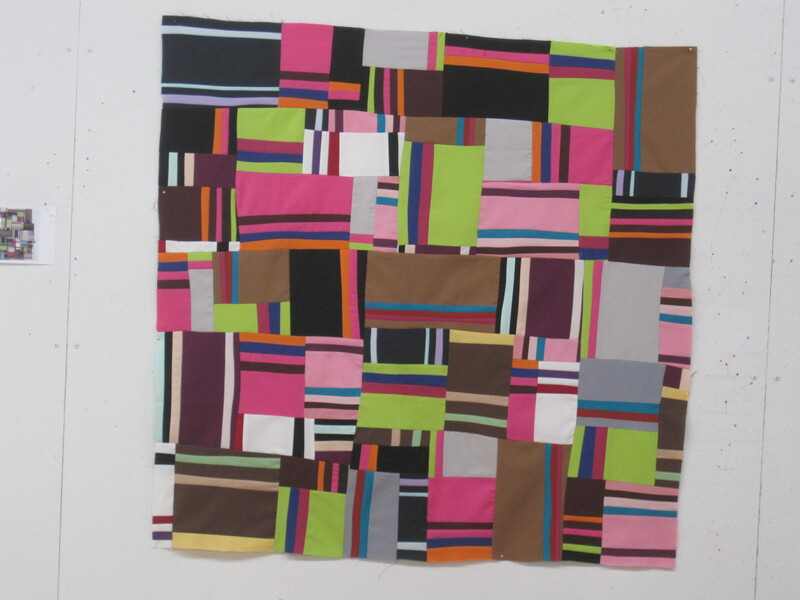 and sewing strips together in various combinations (i.e. dark/light, bright/cool, etc.) 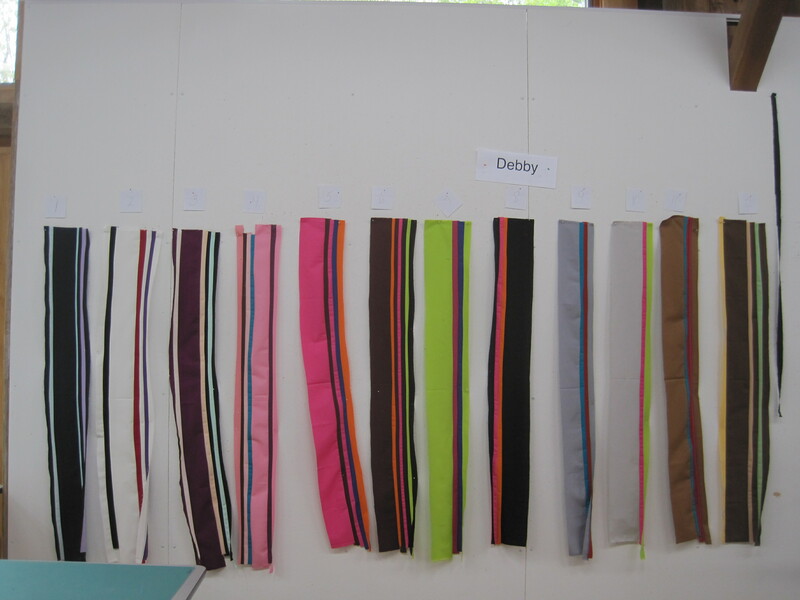 We would be making new fabrics with our own original combinations of colors. We were using all solid colors this first day. 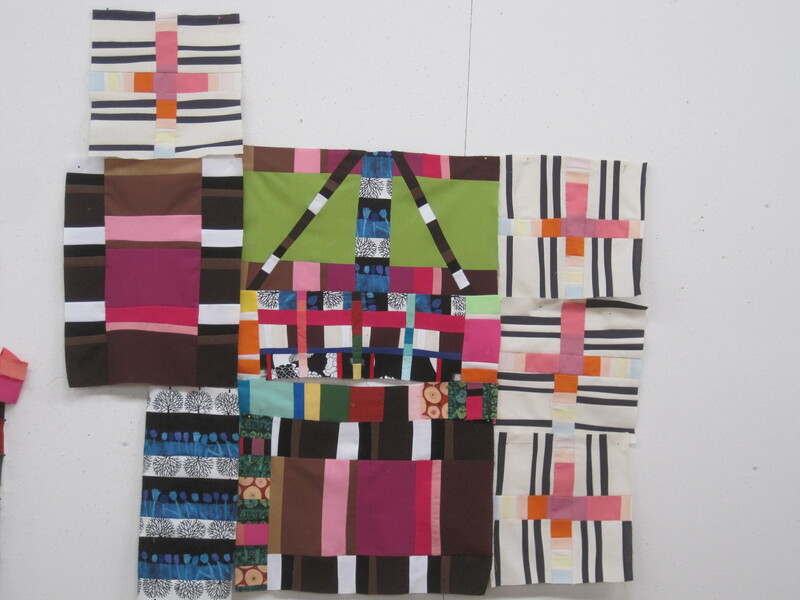 After we had those “fabrics” assembled, we started cutting them and restructuring them into a “composition” (quilt top) on our design wall. I am showing my first top here, even though I don’t like it. 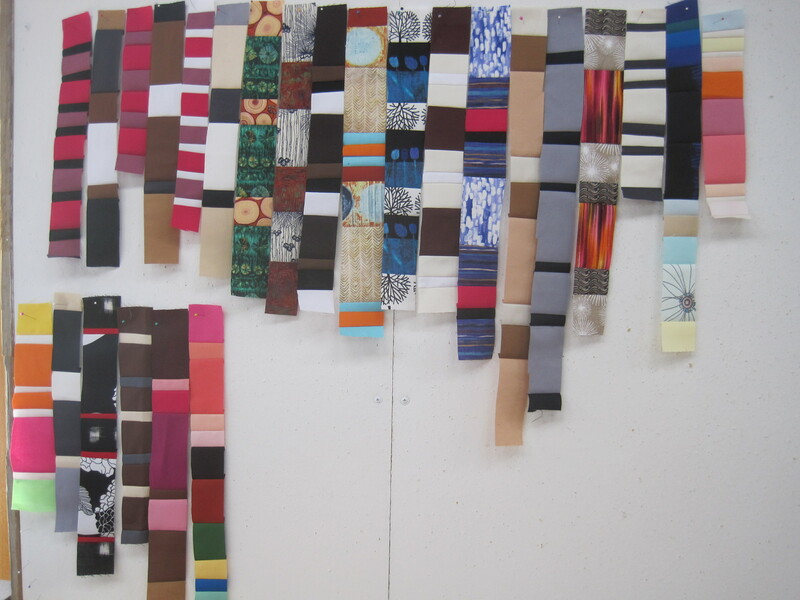 As I said on the last day (when we had to present our work to the group,) when I was putting my strips together, I liked each of them. But when I was finished and looked at them, they made me think of school uniforms. 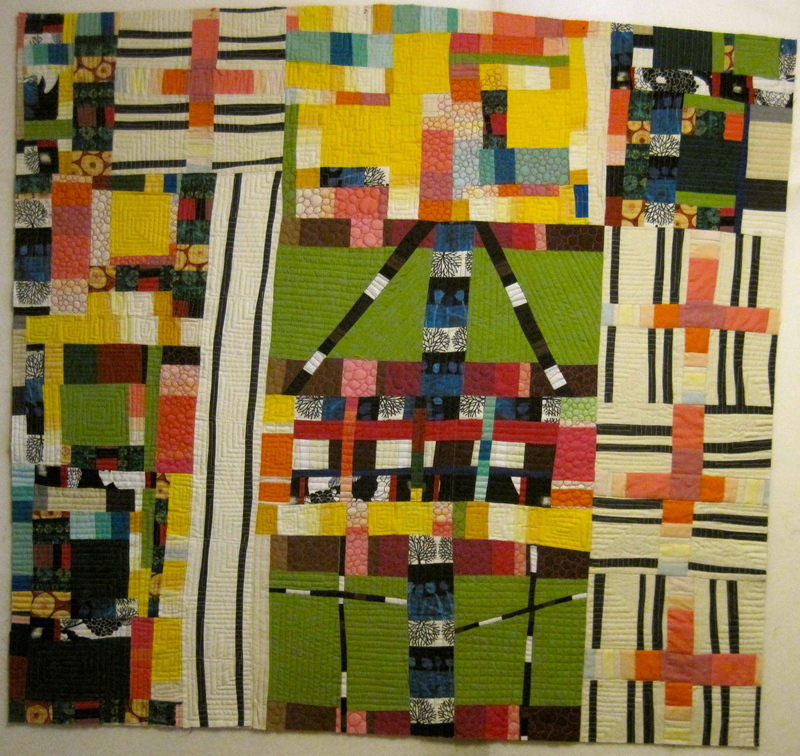 So when I put them together in a quilt top, I still saw “school uniforms.” One of the things that Nancy impressed on us was to not be afraid to experiment and fail. 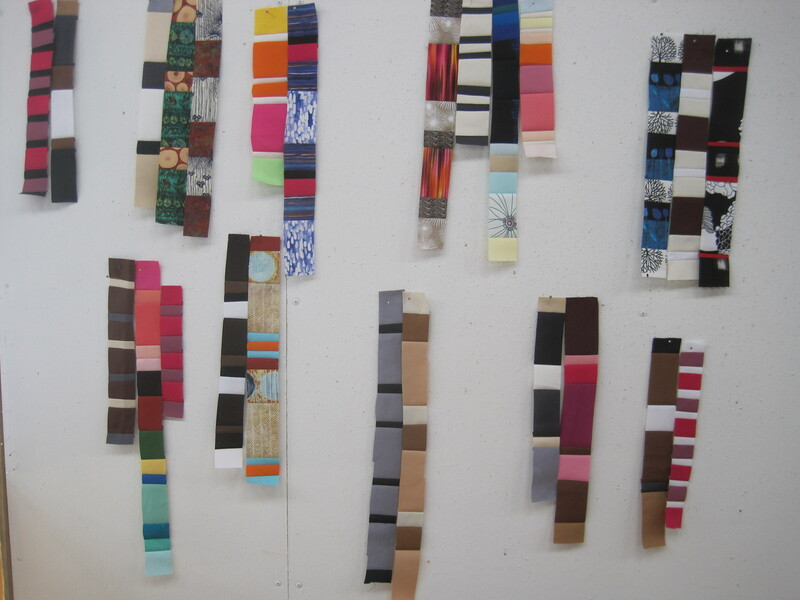 Then, we were given all new sets of exercises to do, first combining strips of neutral and brown fabrics, and then combining colors with some prints. 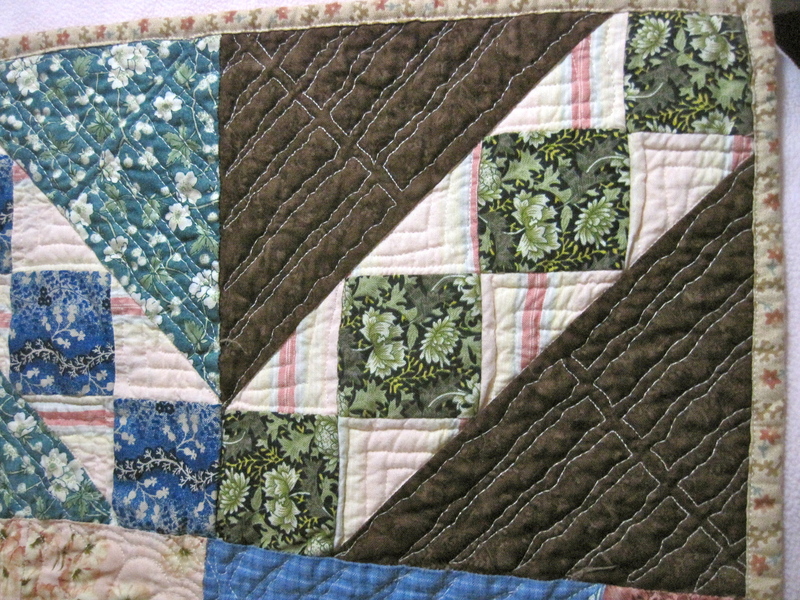 One of the interesting things Nancy said was that you had to be careful of prints, because if you used too many of them in your composition (quilt top) they will start “bossing you around.” And I found that that was true. 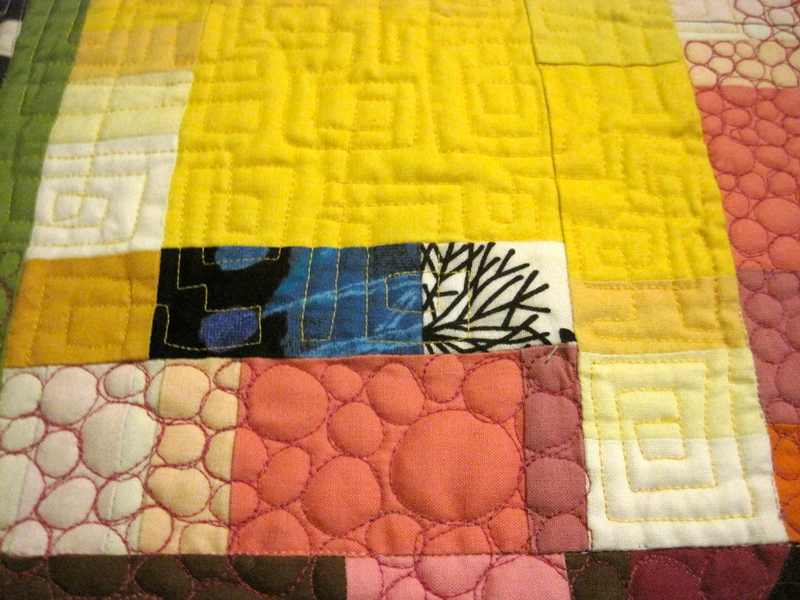 I love prints, and had made a lot of them, but I had to eliminate most of them when I started working on my final quilt. 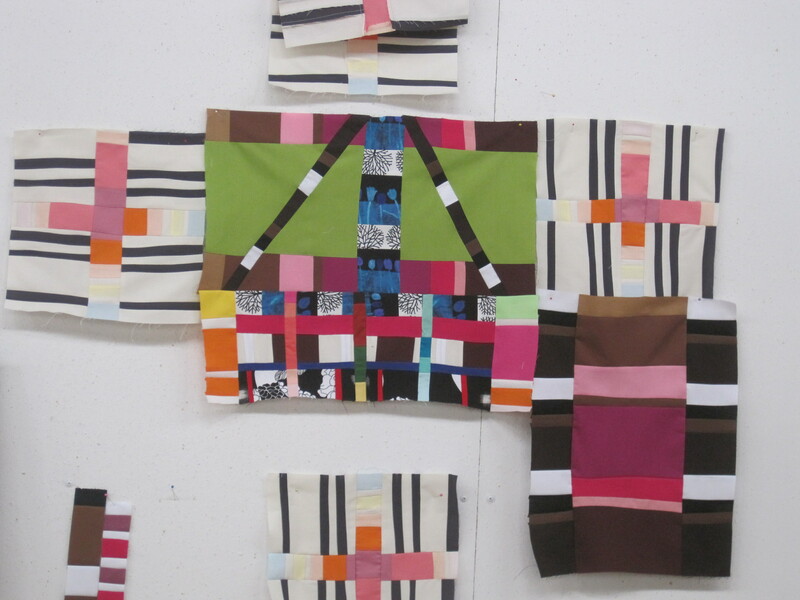 We cut one strip from each fabric for reference, and pinned it to the wall. 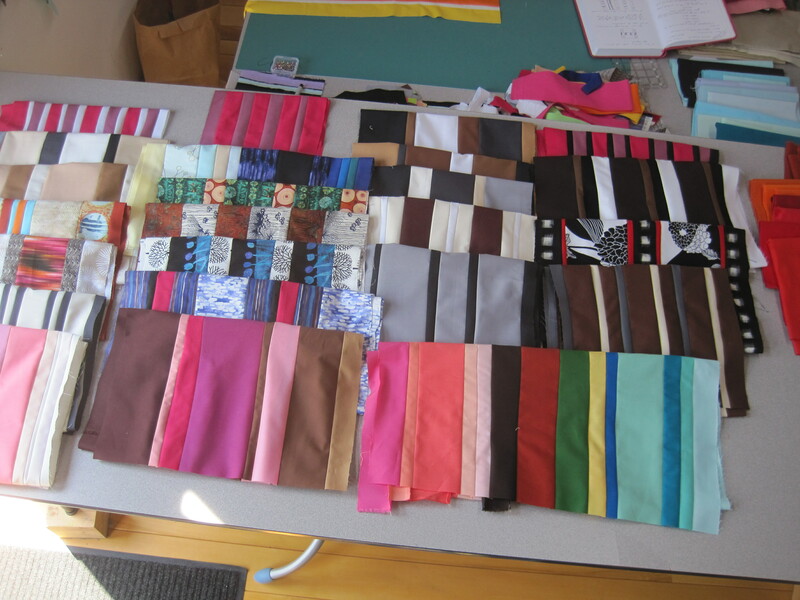 And then assembled all our “fabrics” neatly on our table. They didn’t stay this way for long! I started putting pairs of strips together that I thought might work well. 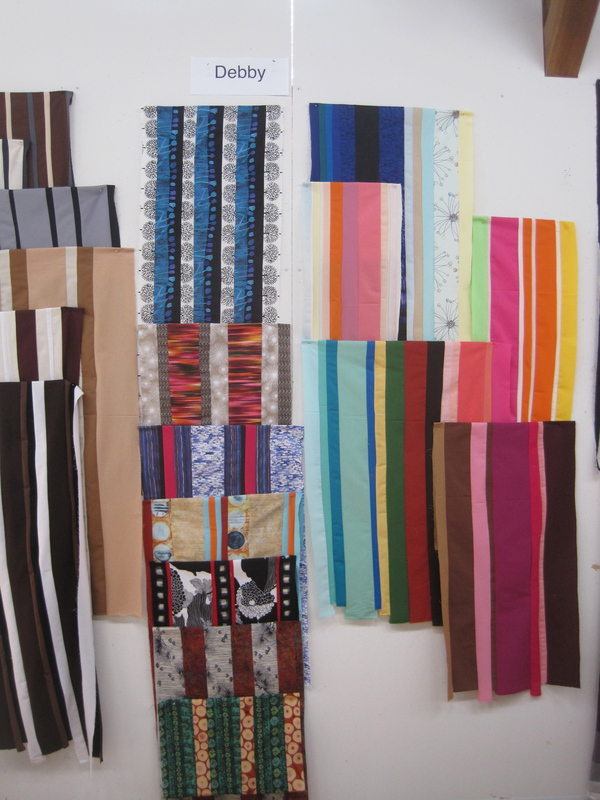 After we had most of these exercises done, we were given new instructions on cutting the “fabrics” (that were composed of our strips) into strips and restructuring them, combining them to make units and small compositions that would then be assembled into our final composition. This was fun, but also frustrating. At one point, my next-door neighbor, a really nice woman who had come all the way from Canada, saw me looking perplexed. She said, “well, where is your figure and where is your ground?” And I just said in despair, “I don’t know.” But we were on a time schedule, and so I just kept on working. With such a large class, it was amazing that Nancy gave plenty of individual attention to each participant. She would circle the room and ask each person, “talk or pass.” If you had a question, she would spend some time with you. But if not, she went on to the next person. On Thursday afternoon, we took a break from our work, and each workshop participant gave a brief (5 minute) presentation of their current work. 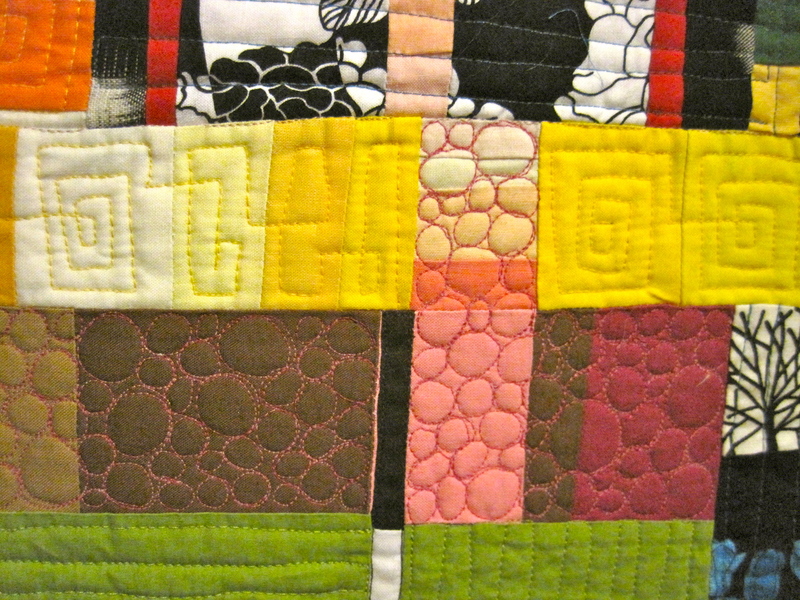 Of course, I shared some of my housetop quilts, and how I love combining quilting with God’s Word. So after dinner, most of us went back to work on our composition. 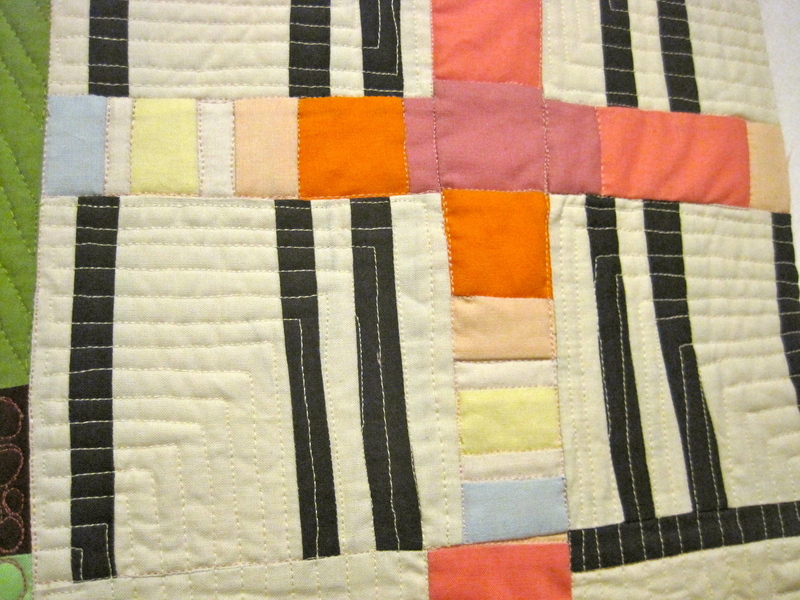 I had cut some simple strips and ‘restructured’ them into what looked like plus signs to me. My neighbor glanced over at my design wall, and said, “after your presentation, I understand your composition a little bit more (indicating that the ‘plus signs’ were indicative of crosses. )” That had not been my intention at all, and I had not seen that myself. THEN, Nancy came around one last time, and I was kind of apologizing for the diagonal lines in the middle piece (I had heard her criticize other workshop participants for ‘meaningless use of diagonals,’) and she said, “Oh, after your presentation, I kind of thought they looked like an arrow pointing upwards.” OMGOSH. It kind of made me cry. Even though my intention was to NOT do anything spiritual, it seemed like God had other plans. So then I just went with it and added two obvious crosses. In the final group evaluation, another person pointed out that there was a very large cross in the middle of the composition. I was not sure I liked it. 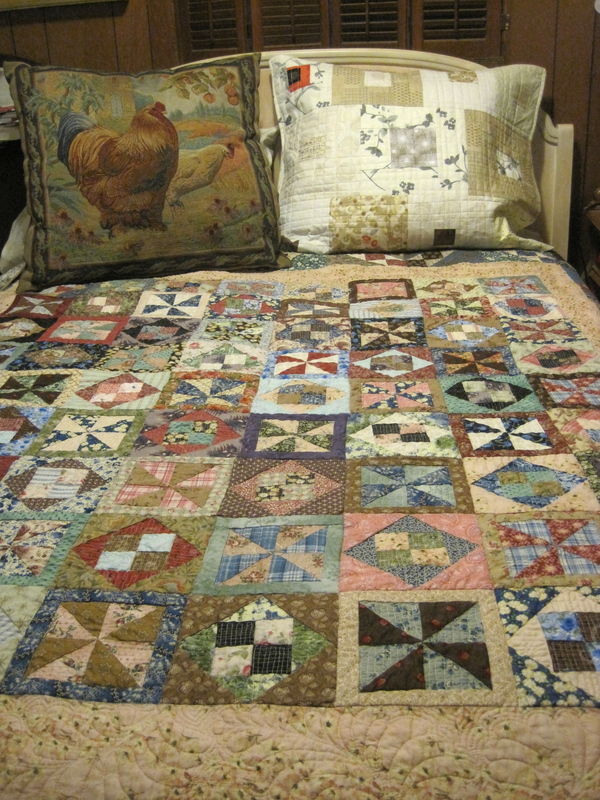 But I decided that rather than try to take it apart and re-do it, or leaving it unfinished in a heap (as most of my workshop projects do) I wanted to quilt it right away. 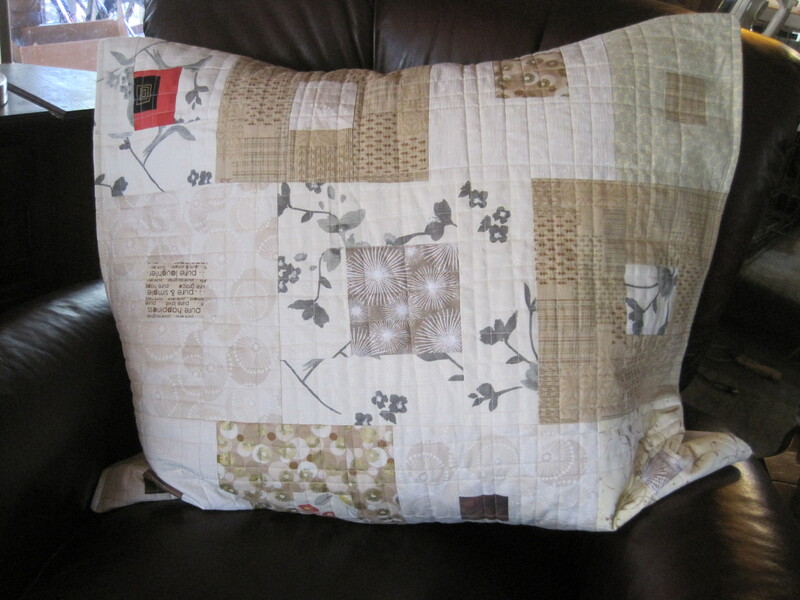 I had a little idea of how I wanted to quilt it, so I started in the day after I got home! I loved the whole experience. If I could I would definitely take another class. I know I have only scratched the surface of what Nancy has to offer. She is taking all of 2014 off from teaching because she wants to concentrate on her own art. Maybe I’ll be back in Ohio in 2015!